HORAN Capital Advisors recently published its Fall 2014 Investor Letter. The consensus view at the start of 2014 was interest rates would rise and economic growth would be globally synchronized led by the U.S. Now three quarters of the way through 2014, it appears economic growth in the U.S. is the only consensus viewpoint being realized. Although we are just a month past the end of the third quarter, September 30th seems a distant memory. 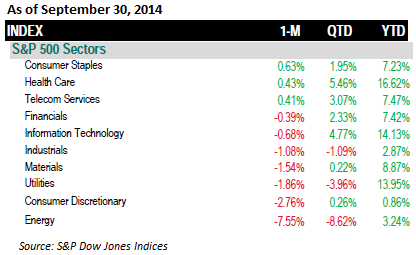 The third quarter ended on a weak note for most asset classes. In the Investor Letter we note headwinds that impacted the equity markets and resulted in equity market performance in the third quarter being the weakest since the third quarter of 2011. The beginning of the fourth quarter has continued to be volatile even with corporate earnings releases progressing better than expected. The 10‐year treasury rate at the beginning of 2014 was 3.03%. The 10‐year treasury ended the third quarter at 2.3% and just recently hit a low of 1.87% on October 15th. The October 15th rate plunge occurred on a day when the Dow Jones Industrial Average swung 458 points, nearly 3% from high to low. For perspective on our views for the balance of the year and into 2015 one can read our Investor Letter accessible at the below link. Today Japan announced an surprising boost to its quantitative easing program. The result was a significant jump in Japan's Nikkei 225 index closing up 4.83%. 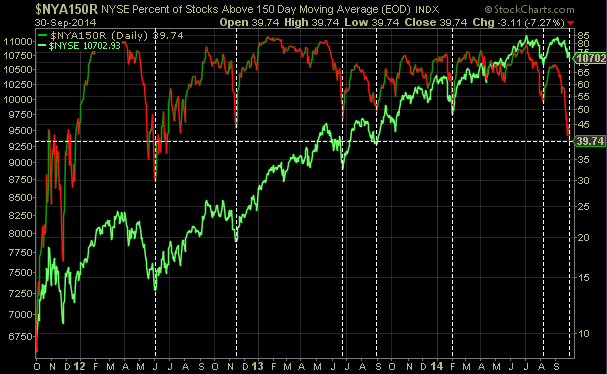 For some or many investors there is an awareness to QE programs seem to be positive for equity prices. Knowing this, ones instinct is to increase investment allocations to economies and markets where QE is being pursued. However, investor's must keep in mind the impact exchange rates will have on non-U.S. market returns when converting the non-dollar returns back to the U.S. Dollar. The recent Dollar strength, and likely a strengthening trend longer term, results in the Nikkei return in Dollars significantly trailing the S&P 500 returns. As the below chart shows, with the strong Nikkei performance today, the Nikkei return is now ahead of the S&P 500 Index (likely not the case after U.S. market open.) 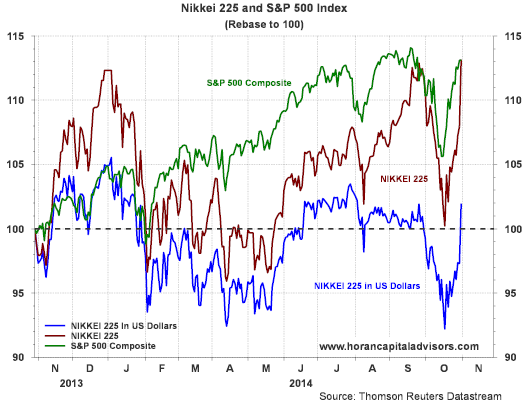 The blue line on the below chart shows the Nikkei return in Dollars. At the start of this past week it seemed the bears were out in force and it led to selling pressure on the indices through Wednesday. However, trading on Wednesday may have been a capitulation day as the S&P 500 Index and Dow Jones Industrial average were down nearly 3% from their respective day's high and low. The market turnaround carried through to the week's end. The only index managing to gain on the week though was the small cap Russell 2000 index which was up 2.8%. Small caps have struggled since late last year and remain down 7.0% year to date. A number of articles in this week's magazine focus on the change in investor sentiment from bearish to more bullish. Ben Carlson, CFA, who writes for A Wealth of Common Sense, referenced a financial advice quote from Jason Zweig of The Wall Street Journal that sums up what investors should be thinking in these volatile times. "I was once asked, at a journalism conference, how I defined my job. I said: My job is to write the exact same thing between 50 and 100 times a year in such a way that neither my editors nor my readers will ever think I am repeating myself." "That’s because good advice rarely changes, while markets change constantly. The temptation to pander is almost irresistible. And while people need good advice, what they want is advice that sounds good." Although an equity put/call ratio over 1.0 is ideal for this sentiment indicator to indicate oversold market conditions, the current .91 level is an extreme one. 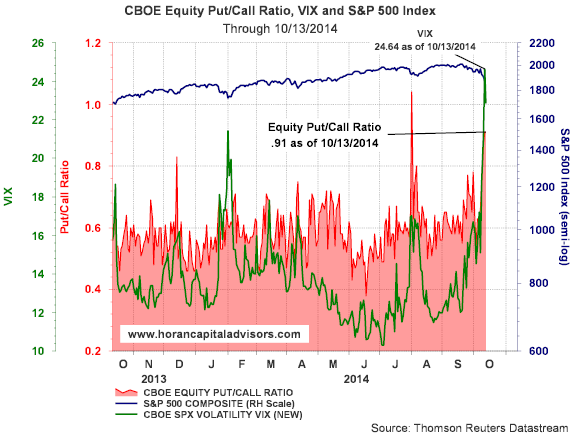 Coupled with the spike in the VIX, today's market bounce is not a surprise. Further indications of an oversold market are the percentage of S&P 500 stocks trading above their 50 and 200 day moving averages. 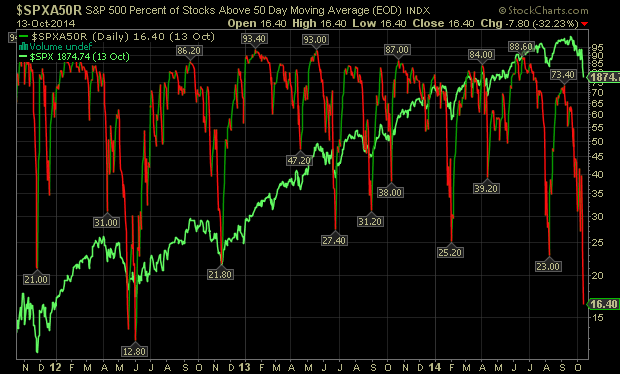 As the two charts note below, this technical indicator certainly indicates oversold market levels. Fundamentals drive stock prices in the long run and we believe U.S. fundamentals remain intact and support higher equity prices into year end and at least through the first quarter of 2015. As was noted in the Trahan interview, the U.S. economy seems to be decoupling for international markets and economies. The market does not move higher in a straight line so continued volatility should be expects. 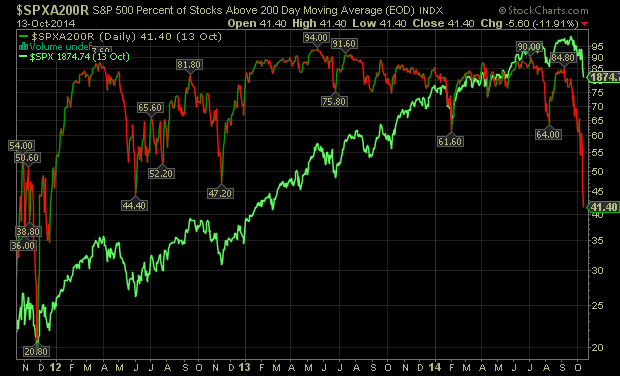 As was noted by Bespoke yesterday, the average S&P 500 stock has corrected 13%. With the market down about 6% from its high, some stocks have certainly corrected by a much larger 13%; hence potential opportunity for investors. One factor that is a certainty at the moment is there is not a lack of strategy commentary around the future direction of the equity markets. The difficulty for investors is deriving an investment thesis from them since many different conclusions are drawn from the market's recent weakness. In a recent interview of François Trahan of Cornerstone Macro by Consuelo Mack on WealthTrack, Trahan believes the next four years could be some of the best for U.S. equities. Trahan is a Founding Partner of Cornerstone and was ranked the #1 portfolio strategist by Institutional Investor in 2013. He has received this honor in seven out of the past 9 years. One key underpinning of Trahan's point of view is the fact macro economic data is responsible for 80% of market moves. In that regard, he believes the U.S. economy and market is decoupling from many of the economies outside of the U.S. If one believes this viewpoint, he notes U.S. economic growth consists of 70% driven by the consumer and only 14% by exports, consumer oriented stocks should do well. As a result U.S. centric investments are an area of the market he expects to do well over the next four years. He does expect further choppiness in the market during the next three months. One mantra that is getting repeated today is "don't fight the Fed." As the end of QE is near and the Fed poised to increase interest rates, probably mid year in 2015, higher rates are thought to be a negative for equities. He notes, however, that stocks can do well in a rising rate environment. 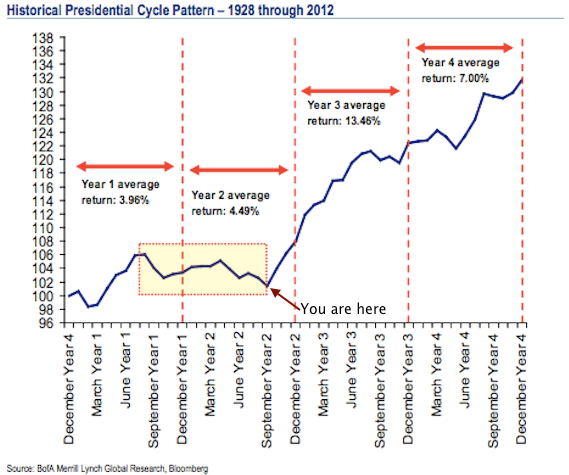 In the 1990's the Fed had four tightening cycles and stocks rose in three of them and were flat in the other. We have commented on this fact as well, Rising Interest Rates Can Be Good For Stocks. The entire interview below is worthwhile to review. the Kospi (South Korea) down 2.7%. In spite of the weakness ending the third quarter and at the beginning of the fourth quarter, the market is entering a seasonally strong period. A number of reports, one included in this week's magazine, note in a midterm election year October is the strongest month on average for the S&P 500 Index. This October market strength carries over into the full fourth quarter through the second quarter of year three of the presidential cycle. History is not a guaranty of future outcomes; however, the future does have a tendency to rhyme. For the week ahead, the economic reporting will be light. 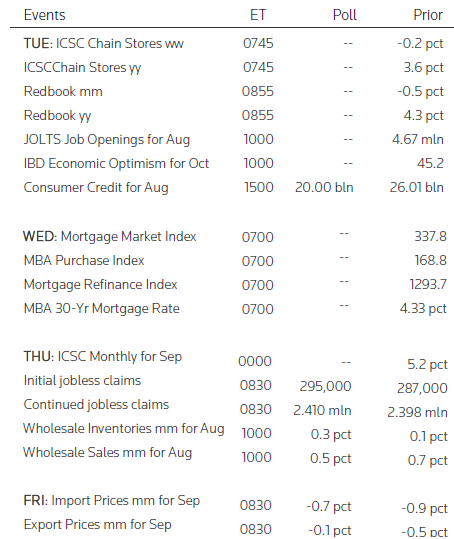 Below is a list of the economic data to be reported in the coming week. Following is the link to this week's Week Ahead Magazine. In September of last years we provided some commentary and a link to an interview conducted by Consuelo Mack with Nancy Lazar on WealthTrack, Is Middle America The New Emerging Market? At that time Nancy Lazar stated the Middle America was the new emerging market. In an interview on WealthTrack last week with Nancy Lazar, she continues to highlight the strengths of the U.S. Nancy was a founding partner of ISI Group and recently started her own firm, Cornerstone Macro. She has been rated as a top economist by Institutional Investor magazine for the past decade. Nancy Lazar notes that China, once thought of as the main growth driver for global growth, is now waning due to China unwinding past excesses. Nancy believes the U.S. has resumed the role of the leading growth driver for economic growth. 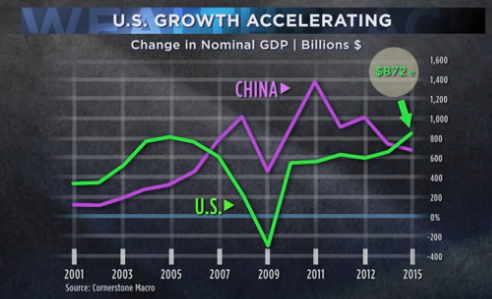 She notes the U.S. is now growing faster than China in Dollar terms. European growth is slowing and this will be a headwind for multinational U.S. companies since 20% of revenue is from Europe. The slowing in Europe is coupled with a stronger U.S. Dollar. Lazar likes the U.S. consumer, i.e., discretionary sector, as the consumer has repaired their balance sheet and has become smarter in their spending habits. This is a bit of a double edged sword as consumers will be more discriminating on where they spend; however, she is projecting a strong holiday retail environment. Chemical industry benefiting in the U.S. as the U.S. is the low cost producer for natural gas. Seven chemical plants under construction in the U.S. today and the build out of these plants runs through 2017. As manufacturing in the U.S. expands, this is creating a multiplier effect in terms of jobs growth. For every one manufacturing job created, 3-4 non-manufacturing jobs are created as well. In short, Lazar is positive on the U.S. and positive on the Dollar. She believes the U.S. economy is no longer in a crisis position and can stand on its won as the Fed steps away from its support. This past week's investor sentiment report by the American Association of Individual Investors (AAII) indicated investor bullish sentiment continues to decline. 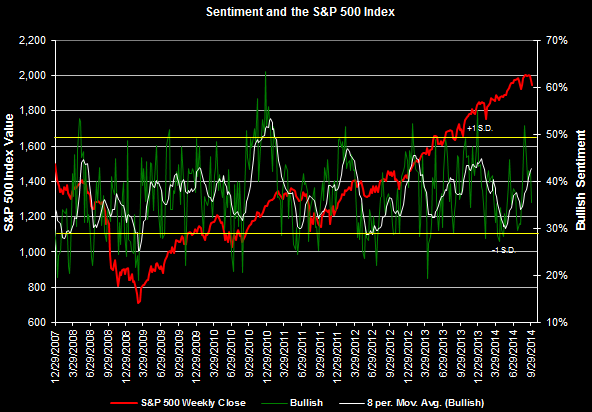 The bullish sentiment reading declined 6.42 percentage points to 35.42%. Individual investor sentiment is a contrarian indicator and is most predictive of future price action when the bullish sentiment is at extremes. If individual investors indicate a low level of bullishness, this would be one indication the equity market could be approaching a bottom. Although the current reading is not at an extreme, investors appeared to become less bullish as the market pulled back from its recent high reached in mid-September. Additionally, as the below Google Trends graph shows, the search on the phrase "stock market correction" has increased significantly from September into October. Given the market's turnaround Thursday and continued into Friday, maybe this recent 4.6% correction will be the extend of the pullback as we have seen from the market over the past three years. If there is one positive to the close of the month of September it is the fact investors can turn the page and set their sights on October and the fourth quarter. September has historically been the worst performing month in a calendar year and this is even truer when the prior month of August achieves returns greater than 3%. In fact, August of this year saw the S&P 500 Index return 3.8% and the Dow Jones Industrial Average return 3.2%. At the start of September, Ryan Detrick wrote an article, Welcome To September, The Worst Month Of Them All, where he looked at September return expectations under different time frames. Well, September 2014 did not go against the historical data. As the below two charts show, developed and emerging market equity returns and fixed income returns were mostly negative for the month. The one index that generated positive returns for the month was the livestock index which was up 6.20%. Anyone buying beef/pork type products in the grocery store is well aware of higher beef and pork prices. 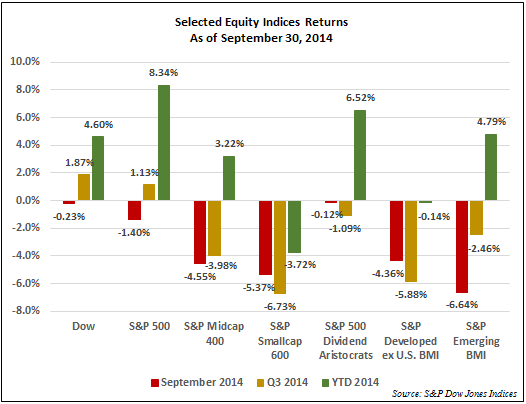 With respect to equity returns, the safest segment was the large cap sector. Both the Dow and S&P 500 Index were down .23% and 1.40%, respectively in the month of September. The large cap returns were far better than the 4+% to 5+% losses in mid and small cap stocks. 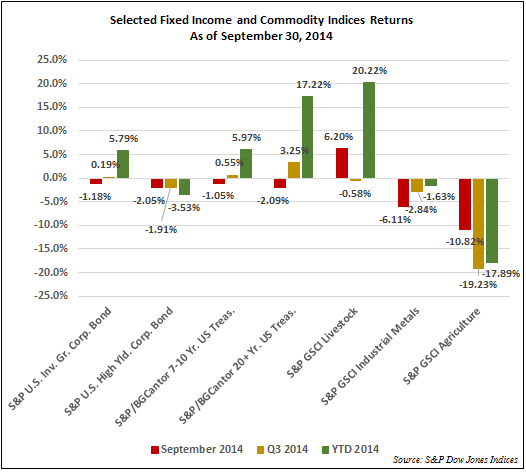 Even fixed income or bond returns struggled. Although not displayed below, the one fixed income segment that generated a barely positive return was S&P's National AMT-Free Muni Bond Index which was up .03% for the month of September. From a sector perspective, energy, consumer discretionary, utilities and materials were poor performing market segments. The traditionally safe consumer staples were the best performing sector with a monthly return of .63%. This return was not even close to overcoming the -7.55% generated in the energy sector. In spite of the tough returns for the month of September and the third quarter, the year to date returns in the larger cap stocks remain healthy. As our clients know, at HORAN Capital Advisors, we have been overweight large cap stocks for three or so years. No one knows whether this recent market weakness will lead to the much awaited 10+% correction; however, the market technicals are not terrible as we noted with the chart in our post on Sunday. Certainly, market technical support needs to be found around S&P 1,950-1,960. These price levels represent the 100 day moving average and the 50% fibonacci retracement. Also noteworthy is the near oversold levels for the percentage of NYSE Composite Index stocks trading above their 50 and 150 day moving averages. As the two charts below note, only 25% of NYSE stocks are trading above their 50 day moving average and 39% trading above their 150 day moving average. 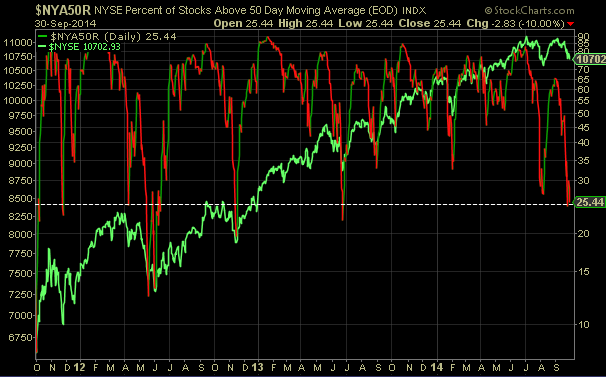 Certainly, lower percentages have been reached in the past before the market finds a bottom. 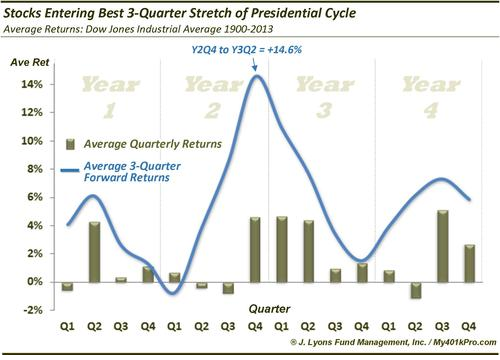 Lastly, historically the 4th quarter has been a positive returning one especially starting late in the second year of the presidential cycle. In an interesting article, The Set Up For A 4th Quarter Rally Is Missing Something, many factors are in place for a 4th quarter rally. One potentially missing ingredient though is the level of investor sentiment, i.e., we are missing the high bearish sentiment reading that has been a variable that has been present in past market bottoms. The just mentioned article is a worthwhile read. My sense is we may not be at the absolute bottom for this pullback. Potential issues facing investors are a stronger U.S. Dollar, the end of QE in October and the midterm elections in November. For the most part though, economic and company earnings reports are more positive than negative. However, many stocks are down much more than their respective indexes and they are providing an opportunity for investors to begin building positions in some of these stocks.